Last June I broke up with Twitter in a haze of tears and drama. 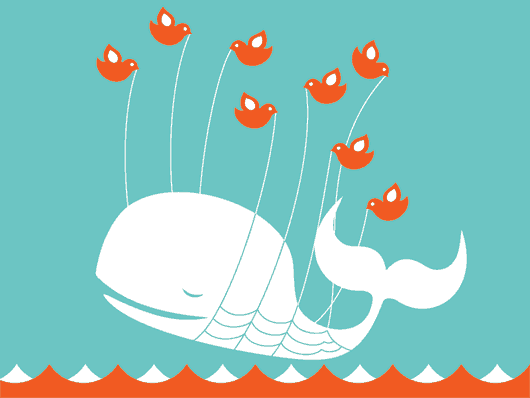 I was tired of unreliability and whales and repeated “Something went wrong!” alert boxes and losing instant messages, and decided it was time to see other microblogging services. Pownce was okay, despite past incidences of seething hatred for it. It had file attachments, post comments, and an okay API. The whole “share files with your friends” angle rubbed me wrong, as I thought, “Isn’t that what email and FTP are for?” but as a feature added on to a microblogging platform it kind of worked. However — no SMS shortcode, no native IM support, and a desktop app that requires AIR. Jaiku had the seeming advantage of being a recent Google acquisition, but as of late that hasn’t proven to be much of an advantage. While they do have [intermittent] instant messaging, a decent API, good stability, post comments, external feed reposting, and plans to move to Google App Engine, the brand has been sitting stagnant for so long that I wonder when they plan to push forward with anything at all. Plus, while they have an SMS shortcode, it doesn’t work for T-Mobile. Rage. 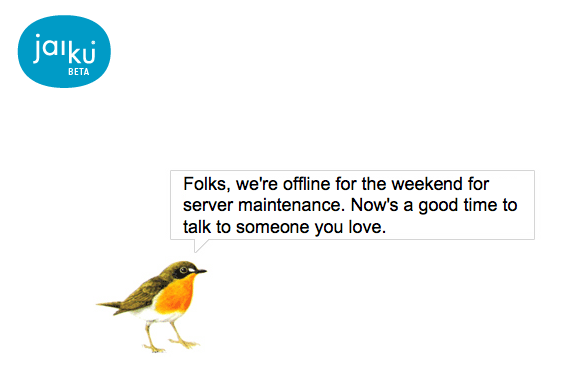 Update: Well, speaking of stability, Jaiku went down in a big way this weekend. Maybe this is part of the App Engine port they’ve been touting, but losing them for a whole weekend without much warning doesn’t give me much confidence in Jaiku right now. Plurk had a unique UI and interesting community features — horizontal scrolling timeline, post comments, karma system, multilanguage action verb dropdown — but there was no API, no SMS shortcode, an IM bot that stopped working soon after launch, and no particularly distinguishing features beyond the fun design and karma. It does seem to have gained traction among Filipinos for some reason, and an “unofficial” API has come out; but without SMS, IM, or ability to post from a native desktop app or from elsewhere on the web, there really wasn’t much incentive to stay on Plurk, and after a while the side-scrolling got so annoying that I would have just stuck to the mobile UI — had I stayed. identi.ca looks like a promising solution, with OpenID, XMPP and an open-source backend supported by a passionate community of developers. If you enjoy reading the Quake 3/Linux troll, identi.ca might well be for you! So yeah, I’m back on Twitter now. Be sure to follow me — and US News, too. I also really miss my Twitter community, but I feel that if I’m not on Identi.ca and helping it to grow, then I’m only supporting the status quo. We enjoy the freedom of emailing people at other domains, and our micro-messages shouldn’t be trapped within a silo. I’m excited for the growth of Laconi.ca and federated microblogging. I hope to see you back on Identi.ca sometime soon!